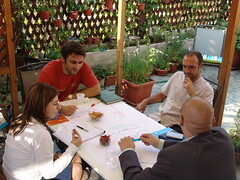 The Romania Green Building Council is pleased to organize and host a “RoGBC Green Cafe”. We will view a film on sustainable architecture http://www.lastcallforplanetearth.eu/video=1.html which includes a series of interviews with world renown architects discussing green architecture. This will be followed by moderated discussions among the participants and a networking/cocktail session. Seats are limited to 25 persons with preference given to RoGBC members then opened to the general public on 2 December. In order to register please fill in the attached Registration Form, and send it to cristina.siu@RoGBC.org. Who: Participants from all construction disciplines are invited. LATER EDIT: As of December 9 10, the number of seats available is 2. The event is now fully booked. November 12, 2008 at 2:10 pm | Posted in Events | Enter your password to view comments. November 10, 2008 at 12:21 pm | Posted in General | Enter your password to view comments. November 7, 2008 at 2:35 pm | Posted in Meeting Notes | Enter your password to view comments. November 4, 2008 at 4:43 pm | Posted in Events, General | Enter your password to view comments.